For hours of fun, purchase a bracelet or points card—online or onsite—that gives you unlimited ride access. The Mega Parc is located within the Les Galeries de la Capitale, , one of the largest commercial complex in Eastern Canada with a surface area of almost 2 millions square feet. Open Monday to Friday until 9 p.m., the centre offers numerous stores including L’occitane, H&M, Hudson’s Bay, MEC, Renaud-Bray, Sephora et Simons as well as a new food court with many restaurants and the largest IMAX screen in the country. Or try Espace Gourmet, the newly renovated food court with over 900 seats and 19 unique restaurants. Give the gift card of the century! Treat your friends or family members to a phantasmagorical Mega Parc experience. They’ll have loads of fun on the park’s 18 rides in a dreamlike setting that harkens back to the industrial age. The Mega Parc gift card can be purchased at ticketing, the information kiosk in the Centre Court or at the Customer Experience Desk near the Cineplex Imax Theater during regular mall hours. Pets are not allowed in the park, with the exception of guide dogs or guide dogs in training. Are the arcade games included with the bracelet? No, the game hall is not managed by Mega Parc. Each machine has its own fee. Are the rides accessible to people with disabilities? Yes, the ride access gates are wide enough to accommodate a wheelchair. All rides meet ADA standards. Can I bring food in from elsewhere? No food may be brought in from outside Mega Parc or Galeries de la Capitale. Can I bring my selfie stick to the park? Selfie sticks, monopods, and similar accessories are not allowed on the rides. Can I buy a day bracelet? Night bracelets are only available at the moment, weekly starting at 5 p.m, for $ 20 + taxes from Monday to Wednesday and for $ 25 + taxes on Thursday and Friday. There is no Day bracelet available at the moment. Yes, there is a sharpening service on site ($). Can I use an old Mega Parc promotion? No promotions for the temporary or former park are accepted. No refunds or exchanges are possible. Can I use my point card from the old Mega Parc? Points card can be redeemed as a credit on your purchase. Do you loan out strollers and wheelchairs? Strollers and wheelchairs are available for free at the mall. Limited quantity. To obtain one, stop by the Customer Experience Desk near the Imax entrance. To borrow one you will need to show valid ID, e.g., a driver’s license. 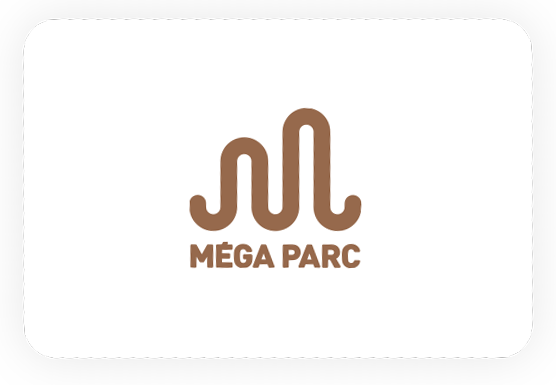 You can subscribe to the Mega Parc newsletter (newsletter link) for updates on our events and promotions. You can also like our Facebook page. Does Mega Parc have a dress code? Shoes, and proper attire are required. Clothes displaying vulgar or offensive language or graphics are prohibited. No swimsuits are allowed. Does Mega Parc sell gift cards? Mega Parc gift cards are sold at the Customer Experience Desk and at the Galeries de la Capitale information kiosk. Carefully select the tickets or bracelets you want before paying, since no exchanges or refunds are allowed. Also, there are no exchanges, refunds, or compensation due to mechanical failure, early closing, etc. You will find pricing information on the webpage for each ride in the Attractions section. Is Mega Parc closed on holidays? Mega Parc is open year-round with the exception of December 25 and January 1. See the full schedule in the Contact Us section. Under no circumstances may a bracelet be loaned, transferred, or resold to another person. Is there a place to leave personal items? You can leave only coats for free at the Customer Experience Desk near Entrance F (IMAX). Ice skates, boots and bags are not accepted. Is there an expiry date for points? My child is below the minimum height requirement for a ride but is the same age as his/her friends. Will he/she be allowed to go on the ride? Children must meet all requirements for a specific ride including minimum height, irrespective of their age. The requirements are designed to ensure your child’s safety on the rides. After buying your points card online, you will receive a confirmation email. This email contains your digital points card. Just show it at each attraction and you will be able to ride. If you have purchased a bracelet, you will receive a confirmation email with a barcode. Scan it at a self-service kiosk and the bracelet will print out. Make sure you read the instructions in the document attached to your email. The resale of points or bracelets is prohibited. It is considered fraud to purchase points and/or bracelets from a third party. We only guarantee the validity of tickets purchased from the Mega Parc box office, the Mega Parc official website, or authorized vendors. Mega Parc accepts cash in Canadian dollars, credit cards (MasterCard, Visa, American Express), debit cards, and Apple Pay. What are the opening hours for the Patinarium skating path? The schedule is the same as for the park. What are the park’s opening hours? The park is open Monday to Wednesday from 11 am to 9 pm, Thursday and Friday 10 am to 9 pm, Saturday from 9 am to 7 pm, and Sunday from 10 am to 6 pm. What happens if I lose my points card? If you lose your points card, simply reprint it by following the instructions on your e-receipt. Check your email inbox to find your e-receipt. What if I lose a personal item while visiting Mega Parc? Come to the Customer Experience Desk near the Imax entrance to reclaim or inform us of lost items. Mega Parc and Galeries de la Capitale are not responsible for lost, damaged, or stolen items. Make sure all personal belongings (cellphones, cameras, cash, sandals, sunglasses, etc.) are secure before you get on a ride. All Mega Parc users agree to release, indemnify, and hold harmless Galeries de la Capitale, its owners, managers, representatives, along with its officers, employees, agents, mortgagees, successors, assigns, and all other persons for whom they are accountable before the law (collectively the “Releasees”) of any obligation, action, cause of action, claim, damage, lawsuit, expense, or request whatsoever that they may have at this time or that they may hold against the Releasees for any personal injury (including death) to themselves, to their children, or to any other person(s) under their responsibility, or for any property damage resulting from their use, or that of their children or any other person(s) for whom they are responsible, of Mega Parc and the amusement rides therein. What is included in the evening bracelet ? The bracelet includes all inclusive access to the rides, for one person, from Monday to Friday, starting at 5 p.m.
What is the fee for the arcade games? The game hall is not managed by Mega Parc. Each machine has its own fee. Arcade game cards can be purchased onsite. What is the price for ice skating ? The price is $ 5.75 + taxes for the day. You can purchase points online, at the express ticketing or at Ice Skating. You can also rent skate for $ 9 + taxes for 3 hours. Lockers are also available for rental. What is the wait time for rides? Wait times vary according to the ride. Peak times are weekends and Friday evenings. To avoid long waits, come on weekday evenings, if you can. What skate sizes are available for rent? Skate sizes range from 3 for infants, up to 13 for adults. What type of food is available at Mega Parc? Mega Parc has different food vendors as Queue de Castor. There are also 19 restaurants to choose from in the Espace Gourmet food court on the 2nd level of the shopping mall, opposite the amusement park. For more information on dining options, visit the website. What types of jobs are available at Mega Parc and how do I apply? Whether seasonal or year-round, Mega Parc jobs are fun and rewarding. See the Jobs section for more information and to submit an application. Where can I get a Mega Parc site map? There is an online interactive map or you can pick up a map at the box office. Where can I pick up my online purchase? You can pick up your purchase at the Mega Parc box office or at one of our ten electronic kiosks. Where can I submit a sponsorship request? All sponsorship requests must be filed using the online form in the Contact section. Who should I contact if I have a problem with my online order? Please contact us via email at info@mega-parc.com with your order number, full name, and phone number. You can also reach us at 418-627-5800 ext. 2.